The new breathtaking novel from the #1 New York Times bestselling author of the This Man trilogy ONE NIGHT WILL NEVER BE ENOUGH . . . Livy notices him the moment he walks into the coffee shop. He's heart-­stoppingly stunning, with a blue-­eyed gaze so piercing she's almost too distracted to take his order. When he walks out the door, she thinks she'll never see him again. Then she finds the note he left on his napkin . . . signed M. All he wants is one night to worship her. No feelings, no commitment, nothing but pleasure. Every defense mechanism Livy has adopted during her solitary life is at risk of being obliterated by this confounding man. He's obnoxious but well-­mannered. He's a gentleman but aloof. He's passionate but emotionless. Yet the fascination is so powerful, Livy can't deny him . . . or herself. M awakens something in Livy, something deep and addictive that she never knew existed-­and that she fears only he can satisfy. But she senses that behind the fast cars, fancy . . .
People think they have Camille Logan nailed: daddy's girl; beautiful, spoiled young woman with her father's bank balance to fund her lifestyle. But Camille is determined to have a life free from his strings. Out on her own, she's made mistakes, including one that found her clawing her way back after a stint in rehab and plenty of bad press. Now, after fighting so hard to be independent and happy, she finds her life threatened as a result of her father's ruthless business dealings. Caught between resentment and fear, Camille prepares herself for the measures her father will take to protect her. But nothing could prepare her for the ex-­SAS sniper who crashes into her life. Jake Sharp resides in his own personal hell. He was distracted from duty once before, and the consequences were devastating--­both personally and professionally. He vowed never to let that happen again. Accepting the job of bodyguard to Camille Logan isn't the kind of distraction from his demons he should take. . . .
Jodi took the nation by storm with Jesse and Ava in her THIS MAN novels. Could there be a man to match him? Meet Livy and her mysterious 'M'. Aloof, addictive and intriguing - ever since he offered her 24 hours of adoration and satisfaction, M has turned Livy's life upside down. It seems they both have secrets - and following their hearts will risk everything. Passionate, authentic and utterly gripping, this brand new novel will be a must-­read for all of Jodi's devoted fans as well as readers of Sylvia Day, J. Kenner and anyone who needs to escape from the day-­to-­day with a love affair that will take your breath away. 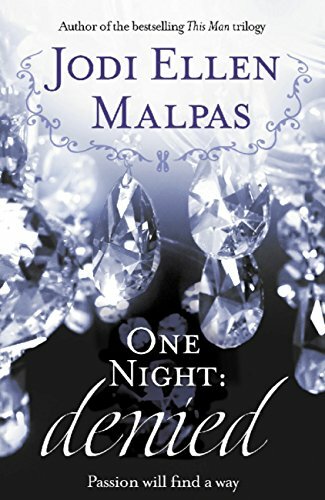 The passion that burned between Livy and Miller in One Night: Promised may end up destroying them both in this new novel of overwhelming desire and shocking discoveries... He's amazingly wealthy, sinfully gorgeous, and can bring her to heights of pleasure she's never before known. For Livy, there's no turning back. She's determined to be the light in Miller Hart's dark world. Yet this new life comes with a steep price... Miller knows that the power he possesses hasn't come without sacrifices-­but he won't let Livy be one of them. Though he wants nothing more than to have her in every way, his first duty is to protect her at all costs...­from his sins, his enemies, and especially himself. But as their insatiable affair intensifies, the two attract the attention of an obsessive-­and dangerous-­third party. Discovering new revelations about Miller that rock her to the core, Livy will have to decide whether he's ruined beyond repair. And he must face his fear that in order to save her, . . .